“He says, ‘Be still, and know that I am God.’"
How do I even do that? I have to admit, I am not one to sit still for very long. I am always in motion going here or there, working on this or that. Stand still? Sit still? Lie still? No way. I shift from foot to foot or fidget in my chair, twirl my hair, and tap my pencil. So, when God says be still, I wonder how on earth I am to accomplish that. The words may sound calming and peaceful, but in Scripture they’re a gentle but firm reproof. “Peace! Be still,” (Mark 4:39) “Be still before the Lord and wait patiently on Him” (Psalm 37:7), “For God alone, O my soul, wait in silence, for my hope is from Him,” “Be angry and do not sin; ponder in your own hearts on your beds, and be silent” (Psalm 4:4), “The Lord will fight for you while you keep still” (Exodus 14:14). God, firmly yet surely tells us to lay down our obstacles, worries and concerns, be still and trust God, it will come in His perfect timing and according to His flawless plan. In the meantime, He tells us to rest in Him and “Don’t be afraid. Just stand still and watch the Lord rescue you today” (Exodus 14:13). We know in our hearts the He is right, yet we hang on to those concerns tightly with both hands. After all, if we don’t worry over our children’s future, who will? If we don’t worry about our parents’ health, who will? If we don’t agonize over life’s disappointments, big or small, who will? He will. That’s what God wants us to understand. 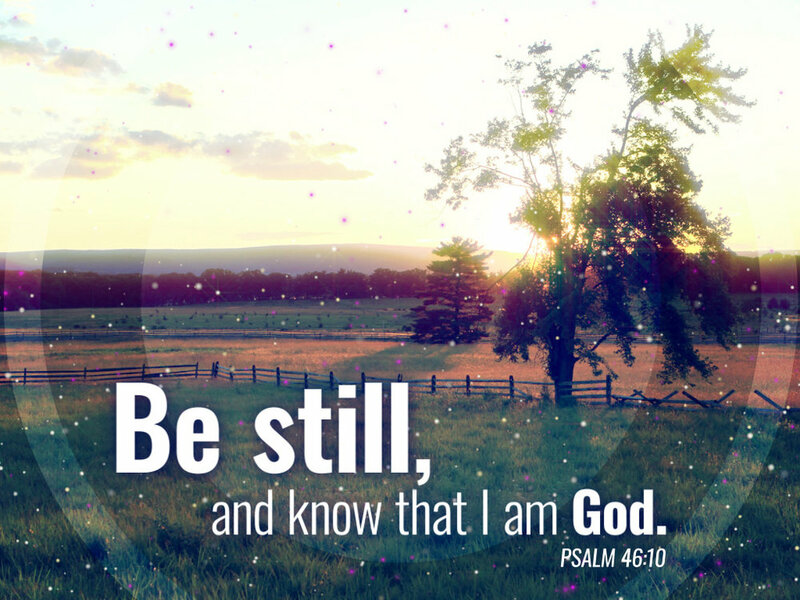 Only when we stop moving, and learn to be still, can we recognize the truth about God: He is in control. No matter how busy life gets, no matter how out of control life seems, God is still in control, and His good and perfect will is certain to prevail. When our verse continues, “know that I am God” (Psalm 46:10a), God is reminding us who He is and what He is capable of in His timing. The creator of all things — including all humanity — knows how to calm our hearts, ease our minds and guide our lives down His chosen path. In the meantime, our calling is simple. Be still. Trust. Be willing. Does this mean in our day-to-day lives we do nothing? No, not at all! Our hands must stay active cultivating the life the Lord has laid before us, be it, in the dish water, at the computer, in the laundry basket, in the dirt, or in the April snow banks. Wherever our day leads us, we need to be fully present and fully engaged. But when obstacles, challenges, or worries come, we can lift them all up to God. When our enemies appear, we can let God handle them. For God to change how we live, He first must change how we think. Step one? Just be still for a moment, rest in Him, and lay it all at His feet. Oh Lord, renew my hope, Oh Lord, give me peace within my soul, knowing that You are in charge. I wait patiently for You, Oh Loving Father, for the abundant showers of blessings that are on their way. I will sing praises unto Your glorious name, as I am graced with love and mercy and I will be eternally grateful. In Jesus’ mighty name, Amen!